There is a big Shivling at Hampi in Karnataka. It is the largest monolithic Shivling in Hampi and is popularly known as Badavilinga. It is located next to the famous Lakshmi Narasimha murti. The huge Shivling is housed inside small shrine with an opening in the front and top. 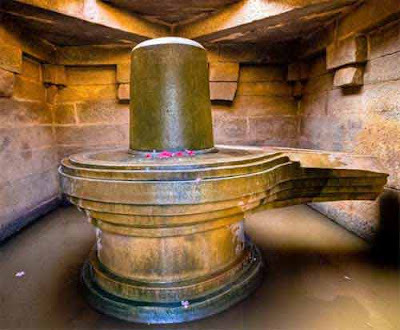 The enormously large Shivling is 3 meters high and the base is 2 meter in diameter. Three eyes of Bhagavan Shiva are carved on the Shivling. Rain and sunlight directly fall on the Shivling. Badava means poor and it is believed that the Shivling was built and consecrated by a poor woman. A channel of water flows through the shrine. A small canal from Tungabhadra provides the water. Like all ancient Hindu temples, the outer structure is in a dilapidated condition. See more pictures of a poor old priest painstakingly taking care of the Badavilinga Temple and Shivling here at India Divine.